Just call it "my old flame." Well, it's not mine, but it is a flame of sorts, a flame skimmer dragonfly (Libellula saturata) and it's firecracker red. We see this species frequenting our pollinator garden in Vacaville, which includes a fish pond, flower beds, and bamboo stakes for their perches. 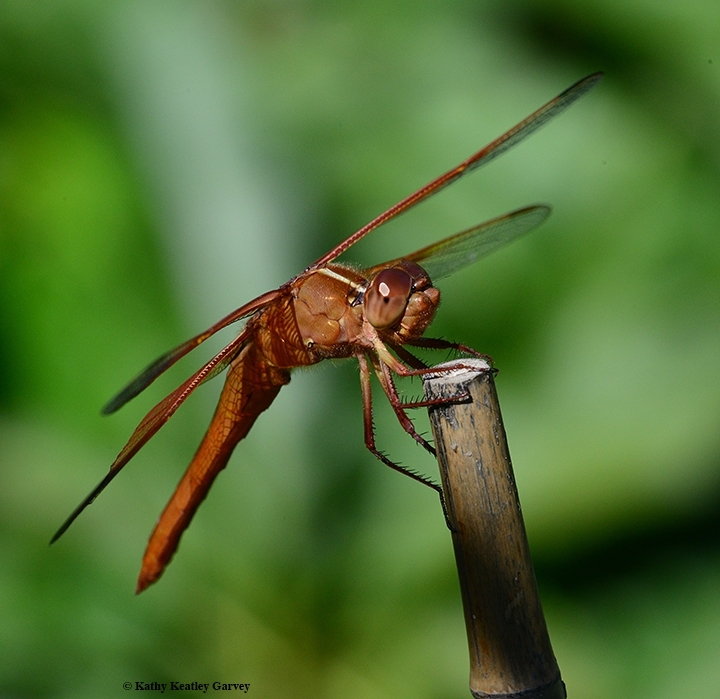 If you like dragonflies, you may want to purchase a dragonfly poster at the gift shop in the Bohart Museum of Entomology, located in Room 1124 of the Academic Surge building on Crocker Lane, UC Davis. It features 18 species of dragonflies, ranging from the common whitetail and green darner to the Western river cruiser and the bison snaketail. And, of course the flame skimmer. The poster? It's the work of former UC Davis entomology doctoral candidate Fran Keller, now an assistant professor at Folsom Lake College, and naturalist/photographer Greg Kareofelas of Davis. Keller received her doctorate in entomology, studying with Lynn Kimsey, director of the Bohart Museum and professor of entomology at UC Davis.